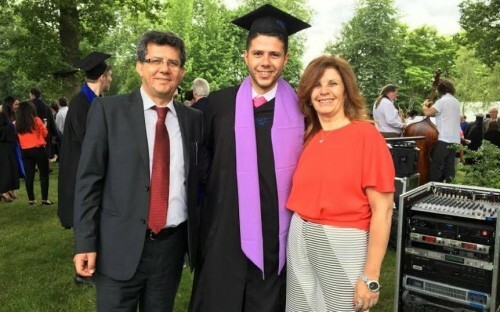 Vincent Eid had never worked outside of his native Lebanon before he completed his MBA at HEC Paris in 2016. Now he's driving business insights through data analytics at Nike’s European headquarters just outside Amsterdam. A former software engineer, Vincent chose HEC Paris for its 56,000-strong alumni network, 16-month MBA format, and location in the heart of Europe. During his MBA, he interned at Paris-based, flat-sharing startup Weroom, and was part of the winning basketball team at HEC Paris’ MBA Tournament (MBAT), which brings over 1,500 European MBAs together to compete across a variety of sports each year. Vincent only applied to one business school for his MBA. He’s happy he made the right decision. How did the job at Nike come about? The first point of contact for the job was through the HEC Paris Career Center, on the internal job board. My career adviser connected me with an alumna working at Nike in a very similar role. I got in touch with her and she told me about the company culture, what to expect in a typical working day, what Nike is looking for in interviews, and what kind of image I had to project. The power of the HEC Paris MBA is in its alumni network. And the HEC Paris brand makes you stand out. What does Nike look for in its job applicants? Somebody who is a fit for the culture, who has a passion for sports, and who can combine technical and soft skills. The culture is very based on collaboration rather than competition, so teamwork is very important. Can you tell me something about working at Nike that most people wouldn’t know? The culture is very friendly. We attend sports classes and play different sports together as a team. This creates a special bond between employees and enables teamwork. Also, opportunities for growth are unlimited, through a "learning by doing" culture, regular exposure to high-level executives, and an environment encouraging constructive feedback. I wanted to go to one of the top 10 business schools in Europe. HEC Paris ticked all my criteria. I didn’t want to give up two full years of professional experience and salary and I’ve always thought that a one-year MBA is too short. The 16-month HEC Paris MBA was perfect. The class size was also ideal, with around 200 students per class, so you can have a personalized experience and at the same time make plenty of connections with people from different backgrounds and nationalities. Would you be where you are now without the HEC Paris MBA? It would have been very difficult without HEC Paris MBA. The MBA gave me the international exposure and overall business skills and soft skills I needed. I also made my first entry into the analytics world through an internship that I did during my MBA. All of these things combined, helped me secure my job at Nike.